In this guide we give you all the useful tips for recruitment, deployment and combat training of Armies in Total War: Warhammer. What you need for a war? Primarily, of course, people who fight for you. You have to recruit them. In Total War: Warhammer, you have two ways of recruiting units: namely, local and global recruitment. - Local: First you can recruit your army units from your provinces. A prerequisite for this is the building that needs to be present - with the exception of the Chaos warriors: They need no fixed abode, since they don’t settle down normally. Therefore, considering that you cannot perform the local recruitment, if you leave the province and embark in a new without homes. Probably you will have recourse to the local recruitment especially at the beginning of the campaign, because initially you lack the financial means to globally attract recruits for your purposes. - Global: As already mentioned you can recruit globally only if you have a few more pennies in your hand. But then you are on the entire map units. Therefore, you will not only need money but also some more time. This variant of recruitment is effective only when you are advanced in the game. Then you have already taken enough Provinces and looted villages, so their abundant gold is available. - Keep the economy stable: Who is self-employed, should always pay attention to his income. Yes, so it is also in Total War: Warhammer. You always should have some savings for a rainy day. Have you got enough reserves, then you don’t have any problems, you can plan your additional spending on the military. Otherwise it may be that your country enters into bankruptcy, if the amount in your treasury fall to zero or even lower. This can end up dramatically. This you must maintain with tax increase, which brings public policy to weaken. Therefore, you must absolutely avoid bankruptcy. This can have disastrous consequences: It threatens the start of a revolt from 0 -100. Here you a hostile army is formed in the middle of your province that prepares you additional problems and needs to be stopped, otherwise they will gain strength with every lap and eventually threatens to overwhelm you. In addition, a bankruptcy leads to corruption which is spreading in your countries by the Vampire Counts and the Chaos warrior. - Secure your limits: Before combat you should put on something diplomacy. To help you ensure safety and security of other nations. It would be ideal, of course, if you do ally with all neighboring provinces so that you can get military support and access to their areas. - Select the right strategy: Your units should naturally be strong. Nevertheless, you should have balance units. Counterattacks are very important, so you should also know what unit is best to counter attack. Check out exactly in advance your destination. If it is a few, small settlements then reach a smaller army. However, if your main focus is on capitals, then you need a large army, so equip yourselves enough arm for battle. Prepare your units for battle, it depends on two things: unit type (ie cavalry, infantry, basement unit etc.) and the ground. Furthermore, you can determine commands via your control. Here you can decide whether you will prefer remote or melee to fight on the front line. Our tip is to first attack with bullets and then to give the order to your melee to take the field when the enemies are closer enough. - Forests: Large units and the cavalry lose movement speed in the wood. However, your troops can find no hiding and so start surprise attacks. - Marshes: Run through mud and mire is pleasant for any unit. Except for giant all units are slow in wetland. They also lose their effectiveness during combat. Therefore, you should place them your dogfighting before the marsh and fire with your rangers to the slower opponents. - Mountains or high positions: floor units should be increased and positioned at best. This increases your range significantly. Moreover, they are better able to shoot over your melee away. Even melee benefit if they struggle somewhat elevated position. - Obstacles: terrain obstacles can create advantages: So bounce bullets off them if they are located in the trajectory of your ranged DPS. 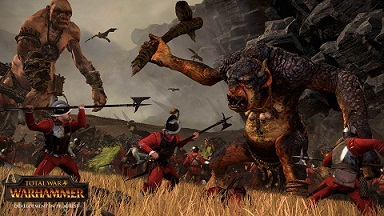 Your armies are in Total War: Warhammer each led by a commander who can look after a total of 20 units. Besides the Army Banner on your screen, there is a vertical bar. That indicates the number of units (troops number), which leads a commander directly. - Head Strength: Take the powerful strong and expensive units into battle - that you can actually taste the victory, and your enemies should have enough counter units. - Floor units in moderation: your attending should hold back, if you take too many floor units with you in the fight. They do indeed much damage and injure even more enemies at once, but they are also very slow and therefore easy to disable by opponents. Also, you look at the old melee. If you then run out of ammo, you're pretty much lost. Except for the dwarfs and the Empire whose rangers are also good melee, no missile unit can quickly switch in a different position, and certainly not the basement units. On the whole, you should include in your army approximately 20 to 25% floor units. - Artillery! Again, you should not take too many units. The artillery is strong but it also has disadvantages: it has limited ammunition and worse in close combat. - Mage: In melee mages are often converted appear equal. You should let them act their strong spell from a safe distance. - Protect the commander: While commanders are very strong, but you should not send them alone in the fight. If they go alone, then the enemy can take them very easily. If you lose your commander, then it usually loses the battle, because the loss of leadership is bad for the morale of your units. - Protect Ranged: The rangers need your protection, because if they are in close combat, they are quickly floored. For this reason, you should specifically set up troops who defend the rangers. - Avoid deserters: Ensure that the leadership of your units remains high. Otherwise flee troops from the battle. They will come back, although some of them, but the deserters can trigger a terrible wave since their escape to the surrounding enemies impact. - Stay on the front: You should refrain from pursuing individual opponents, because they take refuge. You should wipe out any army in full.